AS I WEND MY WAY around traffic circles and down tree-lined streets on Daniel Island, I-m expecting a pleasant morning and a quick look at a custom home under construction. My directions are pretty clear-it is the last house on Watroo Point. And there it is: a beehive of activity where dedicated craftsmen are building this house as though it is their own. I-m greeted immediately by Ben Henrich, and his excitement is contagious as he speaks to me about his building philosophy. It-s simple enough to be summed up in one word-perfection. Henrich is not the sort of guy who rushes into anything, certainly not the construction of a multi-million-dollar home. Before the first bit of concrete is poured, before the framing is started, a lot of thinking and brainstorming takes place. The site itself helps determine the house that will be built because Henrich believes in taking advantage of the views. But that is just the beginning. Extreme planning goes into every house that Henrich builds. Architects Spivey and Woods created the design with input from Henrich. "It was almost a year before we did the first bit of work," he tells me. "My partners and I did a lot of planning and design work in advance." This approach means virtually no surprises during the construction phase. "A lot of builders look at costs," says Henrich. "When they see those costs escalating, they look for places to cut corners or save money. That doesn-t work for me." As we walk through, Henrich points out the details that set this house apart. "Look at this," he says, gesturing from the front door toward the living area, where a serpentine wall of windows beckons the marsh view inside. "You can see the beautiful views from every spot in this house." The dining room features a fireplace and looks out on the Daniel Island Clubhouse, but what captures my attention is the wine cellar, which will be automated so that it will be possible to "order" a specific bottle of wine to be brought up. 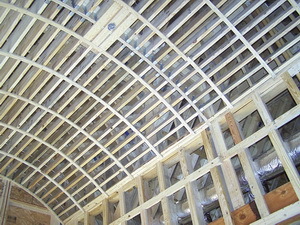 Henrich shows me the arched entry and explains the intricate work involved in creating it. Featuring Marvin custom-clad windows, the living room is designed to make you feel as though the house itself is part of the outdoors. Calling the centrally located kitchen state-of-the-art doesn-t do the room justice. "The cabinets are by William Ohs," Henrich tells me. "He-s a well-known designer from Denver." Upstairs, the vaulted ceiling-which will be crafted of beadboard-gives an almost cathedral-like feel to what will be a media room, complete with a 65-inch plasma TV, pool table and built-in storage for pool cues. 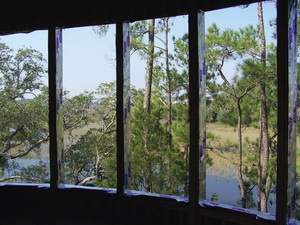 The master bedroom offers fantastic marsh views from nearly every angle, along with his and hers bathrooms and closets. "This is my favorite part," says Henrich, as he sits down. "It-s a steam shower. It adds to the cost but I had to include it." And that is the bottom line. This "cottage in the woods" has so many features not found in similarly priced homes. And even when they are included, they aren-t built with the attention to detail this masterpiece boasts.